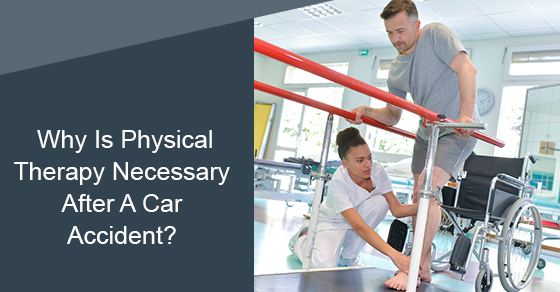 Why Is Physical Therapy Necessary After A Car Accident? | Dynamic Physiotherapy & Sports Injury Clinic Inc.
Why Is Physical Therapy Necessary After A Car Accident? Following a car accident, physical therapy is the most important step you can take. Whether you have undergone surgery for major injuries, or only sustained minor injuries, it’s important to seek the help of a registered physiotherapist who can help you overcome the damage your body has sustained. After a car accident you will probably experience headaches, pain, stiffness and reduced range of motion. Your body does have a natural healing process but there’s only so much it can accomplish without therapeutic intervention. You need to work with a professional to help you return to your normal activities. If not, you run the risk of stalling the recovery process or disrupting it altogether. Car accidents can cause injuries that lead to chronic pain, flexibility problems, and mobility issues if they are not treated. By addressing these injuries right away through physical therapy you are more likely to prevent further damage to your body. Without undergoing physiotherapy you are at risk of degenerative diseases to your discs and tissues. Moreover, the rehabilitation program created for you by your physiotherapist is designed to prevent chance of reinjury, which is important if you have experienced whiplash. Using painkillers to combat the pain associated with car accident injuries is part of the recovery process. However, taking painkillers on their own will only do so much to advance your recovery. You may not feel like doing anything other than resting but moving around can actually help speed up the recovery process. Your physiotherapist will design a therapeutic program that helps promote movement while you heal. When you move, your circulation improves and oxygenated blood and other nutrients can flow properly to the injury site. Furthermore, your physiotherapist will provide pain management techniques that allow you to rely less on painkillers and more on your body’s natural healing process. Accident rehabilitation doesn’t only encompass the physical aspects of recovery, it deals with the mental aspects too. If you avoid physiotherapy following a car accident, you could find yourself dealing with depression and have a fear of getting behind the wheel again. Physiotherapy can help you overcome the mental aspects of being in a motor vehicle accident, so your mental health doesn’t pay the price. If you’ve suffered a car accident recently, please contact us for more information about our accident rehabilitation programs.